Do you know what these tasty little treats are? If not i will tell you all about them. 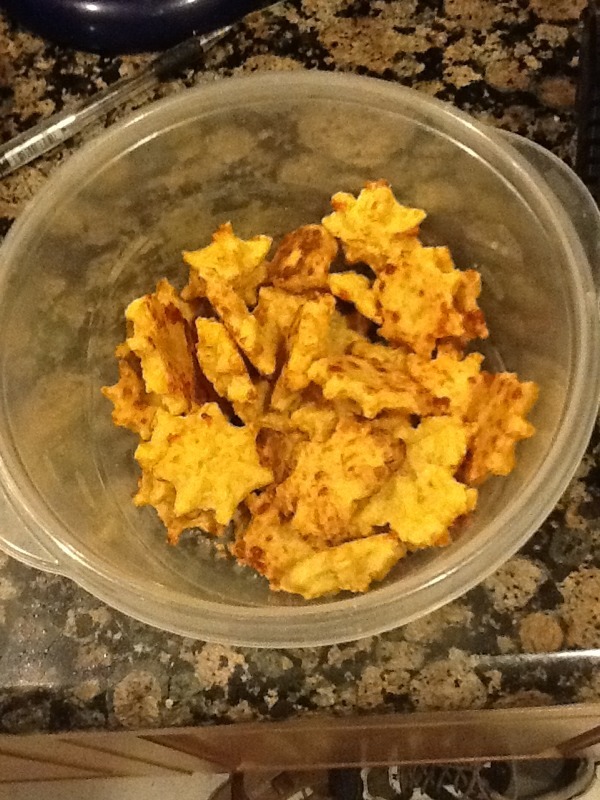 They taste exactly like those little square cheese crackers you get at the store….NO JOKE! But I made them. The texture is a little different, a little softer, not nearly as crunchy, yet AMAZING! cream cheese, butter , worc. Sauce and hot red pepper sauce together until smooth. In separate bowl toss flour and seasonings together with a fork. Gradually add to cheese mixture. Mix until dough holds together. Now if you have a cookie press put it in and commence pressing as you would cookies BUT if you don’t have no fear….roll to about a 1/4 inch thickness and cut into 1 inch squares. Place on ungreased cookie sheet for 10 to 12 minutes or until golden brown. This makes about 4 dozen! AND LAST BUT DEFINITELY NOT LEAST…….ENJOY!!!! Our local Christian radio station has a chef on staff and this is one of the amazing recipes he has shared. This weekend at our Missions Conference a family made this and I hope to try it soon as well! Get more recipes at fln.org/mornings. Preheat oven to 325 degrees. Using about half a tablespoon of butter coat a 9 inch springform pan. Cut a parchment circle that fits the bottom of the pan and place that in the bottom of the cake pan. Wrap the outside of pan with foil and set aside. Melt chocolate, butter along with the coffee over a double boiler until smooth. Reserve. Combine eggs, sugar, vanilla and salt in a large bowl and beat with a hand mixer until frothy and nearly doubled in volume. Fold in egg mixture into chocolate by thirds. This helps to not cook the eggs. Pour batter into prepared springform pan. Place pan in a larger roasting pan and add enough boiling water in the larger pan to surround the springform pan and half way up the sides. Bake at 325 for 40-45 minutes or until set. Remove cake pan from water pan and place on a cooling rack. Allow to cool for about an hour and refrigerate until completely cool. Remove the side of the pan and invert the cake onto a serving plate. Carefully remove the bottom of the cake pan and paper liner. Dust with cocoa and powdered sugar if desired. It’s popular fair/carnival food BUT did you know you can make it at home and it is E-A-S-Y!!! Now the key is to when to add both the sugar and salt. try to gauge the right amount of popcorn to the size of the pan. When the oil starts to sizzle add popcorn (GENTLY) in just a few seconds the popcorn will begin to pop. this is when you add the sugar. Sprinkle it carefully over the kernels (you only want 4 or 5 kernels to have popped before adding the sugar) Not begine shaking the pan holding on to the liduntil the pop corn is finished popping (basiclly until you hear only a few pops instead of many! then remove from heat and shaeon salt. and shake gently with lid one. stir with a wooden spoon and let sitfor a minute or so. Cook’s not: Be extremely careful when adding the sugar, the sugar will cause the oil to snap and splatter! So use a hot mitt if possible! In mixing bowls cream butter and sugars together until fluffy. Add eggs and vanilla and beat until creamy. Blend flour and salt; Dissolve soda in hot water. Add to creamed mixture and beat well. Bake at 350 for 10 to 12 minutes for chewy cookies. they will look light and moist. DO NOT OVER BAKE! Cool on baking sheet for 2 minutes. Remove to wire racks to cool completely. In mixing bowl, beat together sugar oil eggs and molasses. Roll into one inch balls and roll in sugar. Place 2 inches apart on ungreased or parchment lined baking sheets. Flatten slightly with glass. Bake at 530 for 10 to 12 minutes or until puffy and slightly browned. leave cool on racks for 2 min s and then move to wire racks to cool.